WHAT A GEM! Great for entryways, hallways and dinettes or the larger powder room. 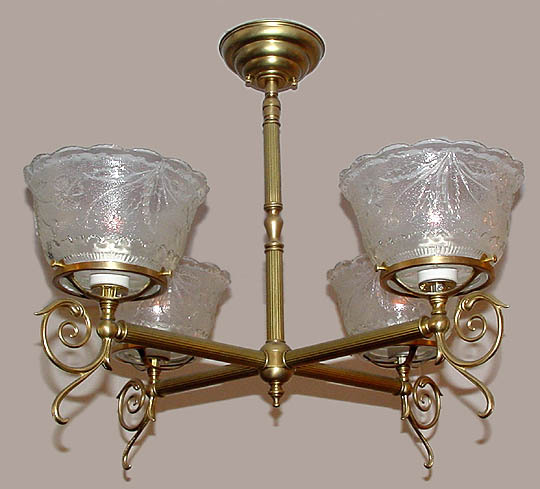 A 4 arm short Colonial Style gaslight reproduction ceiling light with a beautiful glass and lovely antique Victorian styling with a touch of Art Deco. Decorative "dolphin" arm backs below each shade make this one more delicate and bold at the same time! Variable arm length is no problem! Width 24 In. / Height 22 In. or Custom.